I dont know a whole lot about the blue scooter, mainly because I cant get in contact with the owner. I found it while searching the web. After trying to e-mail Simon 3 times, I gave up and got the images off the homepage (which wasn't working properly). I would really like to talk to the owner of either of these scooters, so if you recognise one of these as being your scooter, then contact me. 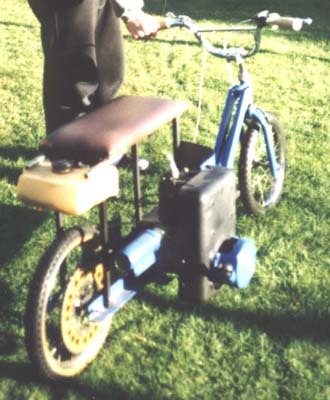 From the look of it, the blue scooter uses a vertically mounted mower engine with go-kart sprockets. The rear sprocket looks around 90 tooth, but I cant be sure. Interesting design, but then again, it is a mower engine, and therefore a little different to mount. 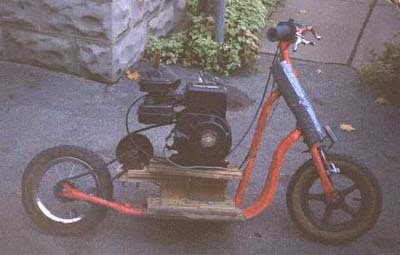 The red scooter uses a Briggs and Stratton horizontal crankshaft engine salvaged from an old lawnmower. The top speed is about 30 KPH. 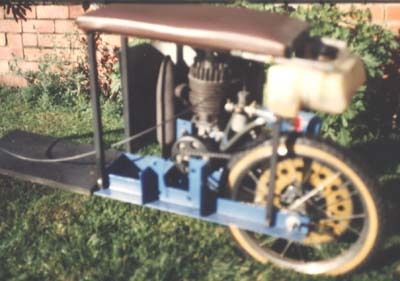 The drive train is made up of the manual clutch from the same lawnmower the engine was from, a converter to convert the belt drive to a chain and then the clutch and brake mechanism in the back wheel. I have recieved an email from the owner of the blue scooter, with some info on it. A guy down the street had buit something similar so i just had to buid one. 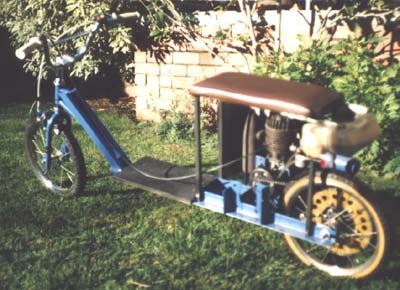 The engine was a Victa lawnmower (125cc i think) - which i picked up off the side off the street and rebuilt. It was build around an old BMX bike i had lying around so thats why the appearance is well, pretty crap looking to say the least. The wheels are taken straight of the bike and since it was an old kiddie bike, the back wheel had peddal brakes - this meant that it could only be driven one way meaning that my engine had to stick out awkwardly. 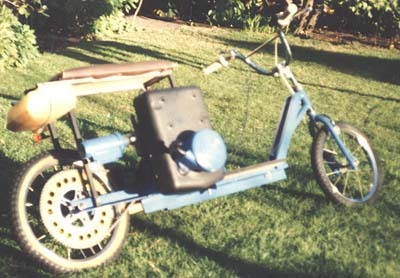 The chain drive is 1:5 using a centrifugal clutch, and a standard go-cart chain and drive sprocket. Total cost was around AU$150. Ugly as it may be with a nice leaded fuel mix it could reach nearly 70km/h. Unleaded was not as spectactular pushing around 60-63km/h max.